When an artist as prodigiously talented as Chris Conn Askew* tells me that I’ve got to check out an artist, I don’t hesitate … especially when he tells me, “he’s been on fire lately!” I couldn’t agree more. Hiroshi Hirakawa has that rare and delicious combination of ferocious talent, tempered by a deep appreciation of historical techniques and precedent. 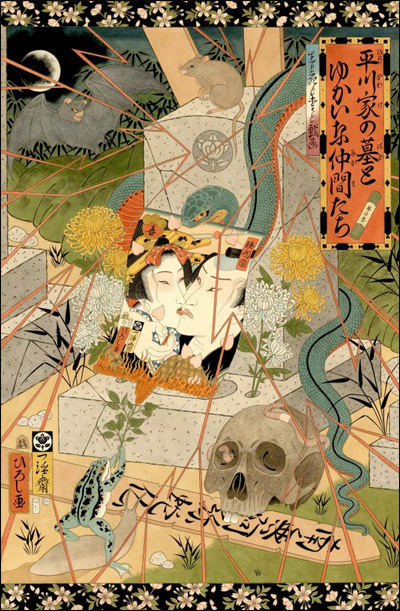 Ukiyo-e or “pictures of the floating world” is a traditional form of Japanese painting and printmaking whose subject matter reflects a deep appreciation of earthly beauty, coupled with an acknowledgment of it’s transience. Hirakawa’s paintings, with their frequent allusions to mortality seem to fit into this genre – or at least to represent a vividly contemporary re-imagining of it. In addition to his epic allegorical works, there is also enough cephalopod love, tattooed odalisques, oblique geishas, and dissolute rapture to enchant and mystify even the most discerning viewer. As far as I can tell, the man behind the images is utterly mysterious, although his website provides a tiny peephole into his world. Luckily for all of you, there is a new print edition by Tattoo Elite International of his ravishing piece, Shrine, now available. *Be sure to check out our upcoming feature on Chris Conn Askew in Coilhouse #5! 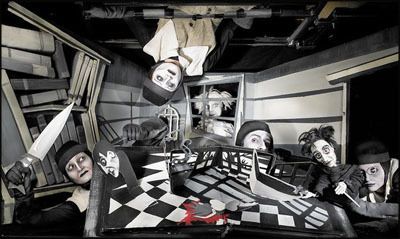 Photo by Sean Williams, 2005 production. 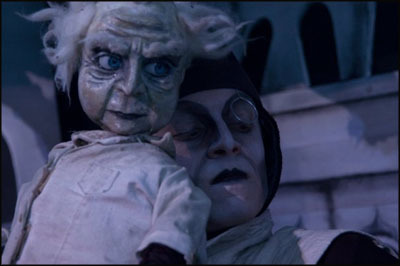 Why don’t ALL puppeteers wear monocles and do acrobatics while performing? That was my first thought while watching Redmoon Theater’s latest marvel, The Cabinet. As the show begins, the audience is faced with a wall sized wooden cabinet, its face riddled with oddly shaped drawers and compartments. Suddenly, a door slams open and gloved hands slide a gramophone out from behind a curtain. More doors open to reveal a darkened stage. Then, as if through the hissing and static of an ancient recording, the voice of the protagonist begins to tell his tale, the story of an unwittingly murderous somnambulist. Photo by Ryan Bourque, 2010 production. Coilhouse being what it is, I have the feeling that at least a few of you are already familiar with The Cabinet of Dr. Caligari, the 1919 silent film that inspired Redmoon’s production. 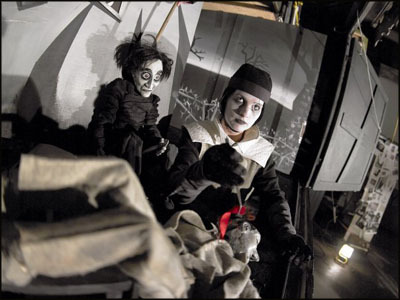 It is a story with as many layers as a matryoshka doll, but on the surface, it tells the tale of a hapless somnambulist (Cesare) who falls into the clutches of a nefarious doctor (Dr. Caligari) who uses the young man as a pawn in his murderous schemes. Ultimately, we discover that the story we have just been told was the delusion of a man in an asylum, trapped within his own mind– a dream within a dream. Please welcome guest-blogger and wunderkammer artist Jessica Joslin’s formal addition to our Staff Page! – Ed. One of the things that I love about living in Chicago is that it’s merely a hop, skip and a jump away from Wisconsin. For those of you on the coasts, that statement may make little sense. Still, I am wholeheartedly convinced that there’s magic there. Wisconsin’s had far more than its share of brilliant eccentrics, outsider artists and charming crackpots. From Alex Gordon’s jaw-droppingly magnificent House on The Rock –a place whose wide-ranging wonders utterly defy description— to the architectural gems of Gordon’s sworn enemy, Frank Lloyd Wright, to the strange and beautiful man-made grottos that dot the countryside, Wisconsin is a treasure trove of wonderful weirdness. Eugene Von Bruenchenhein (1910-1983) was a true Wisconsinite, in the very best (and most eccentric) sense of the word. He lived in a world of his own making, hidden away in a modest house in Milwaukee with his beloved wife and muse Marie. 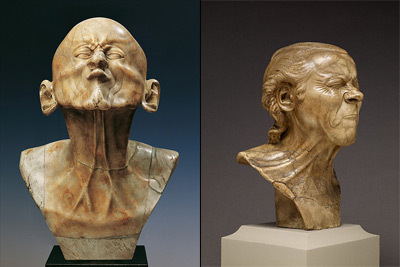 During the days, he worked as a baker, but in his own words, he was a “Freelance Artist, Poet and Sculptor, Inovator [sic], Arrow maker and Plant man, Bone artifacts constructor, Photographer and Architect, Philosopher.” In each of his chosen disciplines, Von Bruenchenhein was incredibly prolific. When his work was discovered shortly after his death, his home was literally stuffed to the gills with his creations. 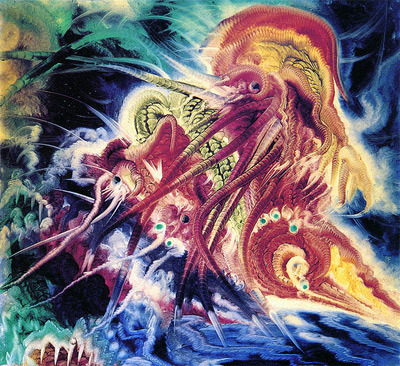 His paintings are vivid, apocalyptic explosions of color, swirling with mysterious monsters and elusive, organic forms. 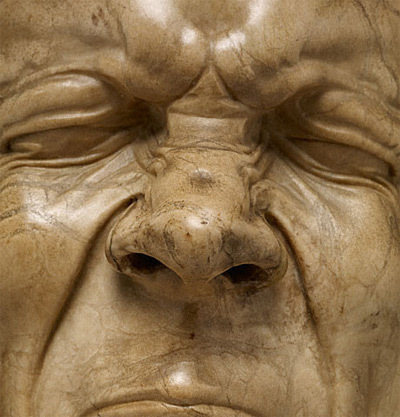 The distinctive surfaces are partly a result of his process. Since brushes were often an unattainable luxury, he used his fingers, twigs or bushes made of his wife Marie’s hair. Marie herself is a lovely enigma. Eugene clearly adored her. She was his one and only model in a series of photographs influenced by the pin-up imagery of the time. In his images, he turned her into a queen, a goddess, a siren… constructing crowns out of tin Christmas ornaments and adorning her with wreaths of pearls. 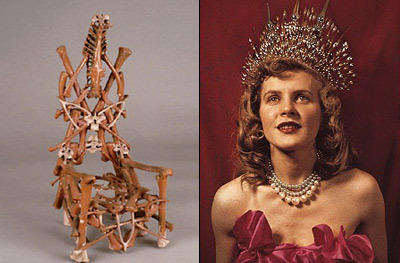 Left: one of Von Breunchenheim’s bone chairs. Right: A photographic portrait by Von Breunchenheim of his beloved Marie. It was Von Bruenchenhein’s bone chairs that first caught my eye. They are tiny and intricate, constructed from the detritus of many a chicken dinner. Apparently, he ate a lot of chicken, because he also constructed wonderful little bone towers. They look almost like architectural models of the Watts towers. To see more, visit his extended biography at Kinz + Tillou and view a great collection of photos at the Hammer Gallery site. More images after the jump! We’re proud to post the first installment in a series of artist features by Coilhouse contributor and friend Jessica Joslin! Jessica and her husband, painter Jared Joslin, appeared in the first issue of the magazine. Jessica was also interviewed on the blog last year. In the post that follows, Jessica takes a look at glass virtuoso Andy Paiko. Lately, I’ve had glass on the brain. In part, it’s because I recently had the chance to indulge my (admittedly very nerdy) obsession with Leopold and Rudolph Blaschka. I saw some of their glass jellyfish, for the first time, at the Naturhistorisches Museum in Vienna and the glass tentacles are still vividly trailing through my dreams. Andy Paiko seems to have more than a bit in common with the Blaschkas. There is a palpable sense of dedication to finely wrought craftsmanship and to the lusciousness inherent in the material itself. There is also a fascination with science, particularly with Natural History, and with preserving and celebrating relics from the natural world. Somehow, I suspect that all of the above were also ardent fans of Ole Worm‘s taste in collecting. Like something from a Cabinet of Curiosities discovered in a dream, Andy Paiko’s mixed-media glass sculptures are mysterious, exquisite and very, very covet-worthy. 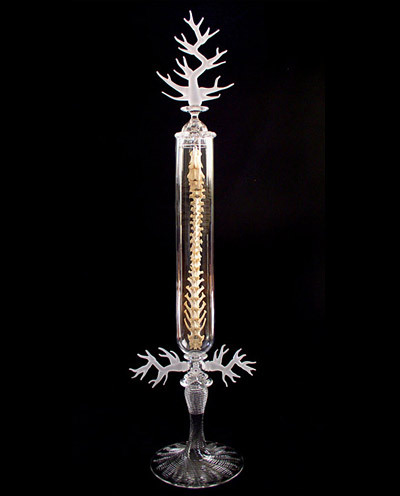 Paiko’s sculptural vessels include a dizzying array of baroquely ornate glass bell jars, designed to house bones, shells, coral and other natural (and sometimes gold-plated) treasures. 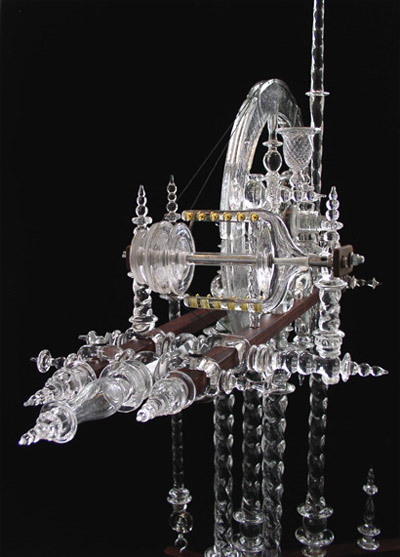 A related show-stopper is a glass chair, with compartments designed to accommodate objects, including a rhesus monkey skull and rodent skeleton. As if that weren’t enough, there are also machines…antiquated mechanical devices, which have been lovingly re-created entirely in glass. His seismograph, balance scale and spinning wheel are, improbably, fully functioning replicas. There is a wonderful video online that shows some of Paiko’s devices in action. Check it out here. More images after the jump.